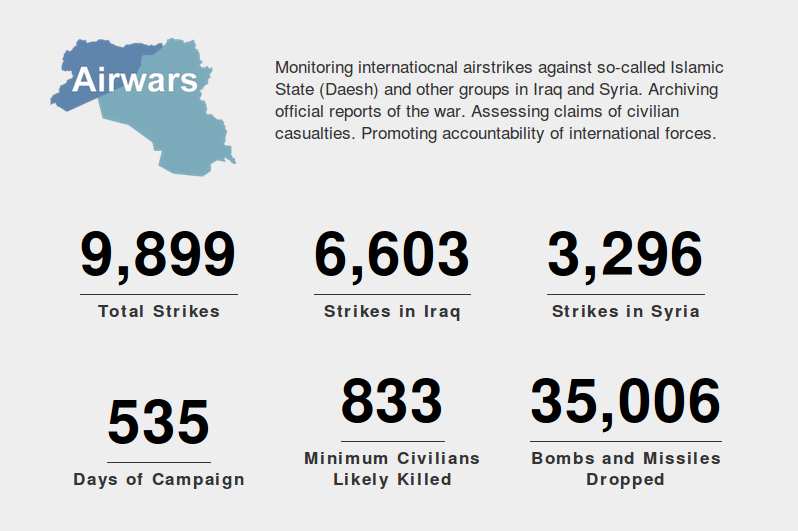 Last night, we treated airwars.org with a new front page, more in line with our ambitions and what we do. And the writing of articles on key questions. In addition to better presenting the breadth of our work, this new page is also Wordpress-based, which means that the numbers will now be updatable by a regular human with no knowledge of coding and SSH-ing into a server. Usability: +1,000. Now, my dataviz things won't be left to rot: they just moved to the apt URL /data. We will be updating this page weekly - that is, starting from whenever I manage to lose the habit of updating it as soon as I receive CJTF-OIR's report in my inbox.